Stop filling out forms and filing original return receipts! Paste your recipient's address and your PDF is ready to be sent by snail mail. One click to send it both certified and regular mail. Mail two thousand as easily as one with no time wasted printing and assembling! Get mailing confirmation straight to your inbox for safe keeping. You'll also get certified and priority mail delivery upates and signed official USPS electronic return receipts. Don't waste time filiing original receipts and green cards you'll never need - they're in your inbox and on our site if you ever need them. Slash your Total Cost of Delivery by making it fast and easy to send certified mail. Our print facilities get it done far more efficiently and for less, with no driving to the post office for a "scan in". Send and track certified mail from anywhere. Our mailing Certification and USPS Proof of Delivery is available anywhere. No need to get to the office or the post office for special forms. Drag and drop your PDF and enter the address. One click to send Certified And Regular. Sending certified mail online is as easy as email with features that regular mail just can't deliver. USPS Certified Mail is recognized by most contracts and courts, so that's how we send. 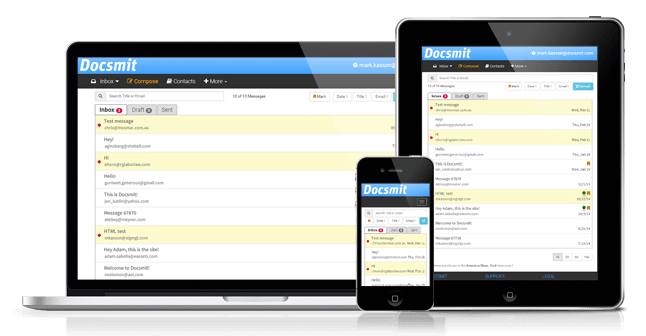 Docsmit provides USPS Proof of Delivery as well as our own Certification which includes a copy of the document sent. There were errors on the form. Please make sure all fields are filled out correctly.